Macaronis Resort: All trips in June are 20% off while supplies last! Must confirm dates that line up with the transfer schedule provided by the resort. Offer available until May 15, 2019. Put simply, Macaronis is the funnest wave in the world. It is also one of the world’s most consistent high quality waves, ultra-rippable, and a bucket list destination for any surfer. Imagine, empty white sand beaches extending into clear warm water where perfect waves peel around a myriad of reefs wrapping into multiple pristine bays… it’s the place surfing dreams are made of! Macaronis Resort is situated on Siniai Island, just off the coast of North Pagai Island in the southern region of the Mentawai Islands, Indonesia. It is in a very remote area, 120 nautical miles from Padang, West Sumatra. The largest village and port on North Pagai Island is Sikakap, with passenger ferry transits to-from Padang. From Sikakap a speed boat transfers guests to Macaronis Resort. Macaronis Resort guest suites were recently refurbished in 2016. All 16 guest suites are located on the second-floor of the resort building, elevated 8m above sea-level with spectacular ocean, lagoon, and pool views. 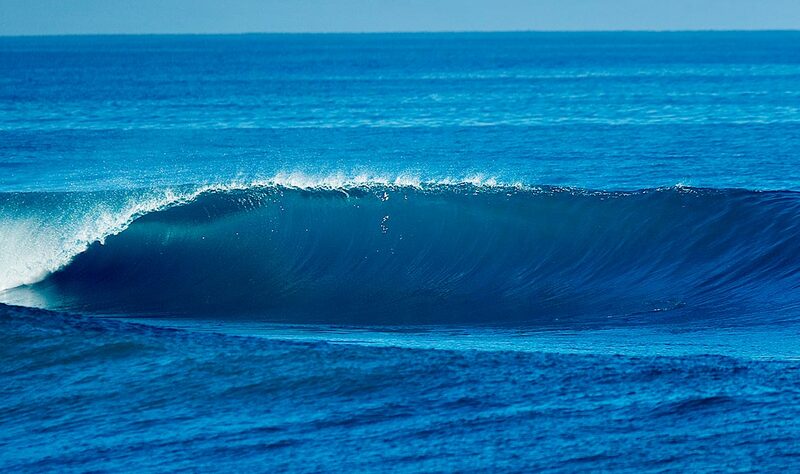 Day in and day out there is no better wave in the world. Must purchase two vouchers or more to qualify for this rate. Or call us at 714-369-8121 to place your order today! 10, 12, or 14 Day Guided Surf Tour. Price is per Person, Buy One Voucher per Person. Deposit to hold this voucher is $212 USD. Buyer has a 48 hour grace period before final confirmation and full balance payment is due. After 48 hours the full trip balance will be processed on the same card and the final voucher will be sent via e-mail along with detailed instructions on how to plan your trip. All balances made via credit card are subject to a 1.9% processing fee. Alternative methods of final payment by check or wire is available upon request. Guest Suite: Queen or two single beds, air-conditioning, daily room cleaning, fresh towels, sheets changed twice a week, ensuite bathroom, hot shower, work desk, clothes storage, in-room WiFi internet, 32″ flat screen TV with movie channels and live surf cam of wave, DVD player and large veranda. Meals: Early Continental Breakfast Buffet, Hot Made-to-Order Breakfast, Plated Lunch, Three Course or Buffet Dinner. Beverages: Purified Drinking Water, Juice, Milk, Brewed Coffee and Tea Making Facilities All Day. Surf Boat Transfers: All boat rides to surf at Macaronis and other local surf breaks, plus occasional day trips to more distant surf breaks within a range of 25 miles, depending on surf conditions. Recreational Boat Use: Including guide to go fishing, snorkeling, to the village, or island exploring. Recreational Equipment: Includes snorkeling gear (10x), spear-fishing equipment (3 quality guns), trolling and popping fishing equipment, kayaks, 2 stand up paddle boards and a range of beginner soft-top surf boards. Internet: Free wifi internet in-room & through-out resort grounds. Mobile Phone Signal Booster: Allows SMS and phone calls when signal is strong enough. Stainless Drinking Flask: Plastic throw away water bottles are banned from the island. Hotel & Restaurant Tax: 10% Hotel & Restaurant Tax levied by Mentawai Govt. Local Village Donation: Silabu Village Donation Rp. 20.000 / day. Tips for the staff (Tipping is not mandatory but appreciated! And is distributed among the local staff only).